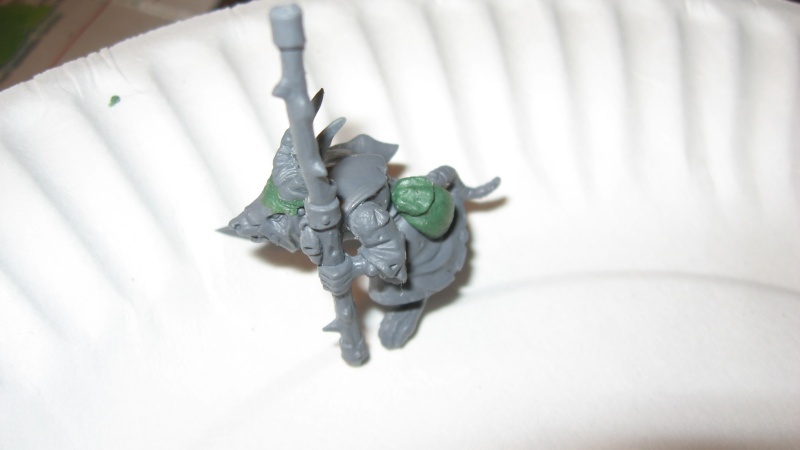 This is my attempt at crafting my own Grey Seer, a Skaven caster that traditionally has hornage. In retrospect, I could have not used the Plague Monk head and it might have looked a lot better. Not super happy with the sword arm (cause I'm picky) either. Also now that I think about it I could probably cover up a lot of the boils (more of a plague monk thing that a grey seer thing) with some sanding and green stuff. But the pouch came out really well! Green Stuff works so far. I decapitated my dire wolves because I had a change of heart about how awesome the metal heads are (they're awesome!). The heads didn't come off super clean (on one wolf I tore a chunk out of the shoulder) so I used green stuff to join the metal heads to the plastic bodies and stuck it with my knife until it kind of looks like fur. I made two more stone bases and I think they look a lot better. I used half as much Green Stuff as on the tall one and made the stones wider. That basically makes the difference in keeping them from rounding too much and looking funny. My tools thus far are pretty brutal. Grimy exacto knife and a wet toothpick. Actually the knife is wet, too, and so is the sheet of glass I'm working on because otherwise the green stuff will stick to it like crazy. 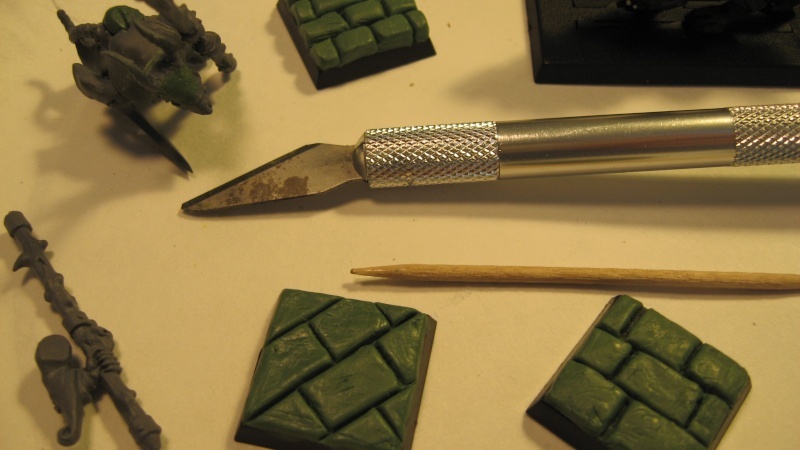 Do most of the cutting and shaping with the knife, and I roll the toothpick to flatten and smooth the green stuff (the stones are intentionally scuffed up a bit to make them look worn; the toothpick rolling actually works pretty well). the grey seeker looks pretty bitchin and i disagree with you, i think the sword arm looks pretty damn cool. 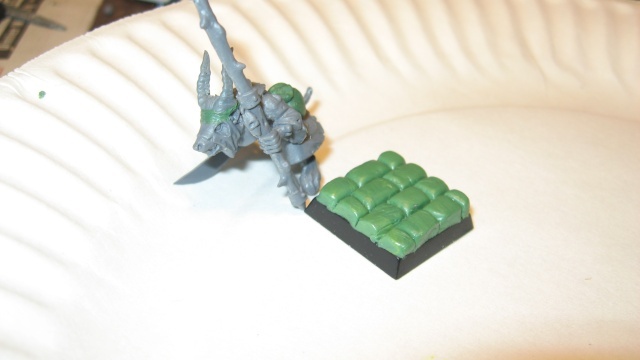 as for the stone bases i think the one that lays across the base diagonally looks the best. also the one with more tiles looks weird cus you made the indents too deep, if you make them more shallow it will looks less fat. That's why I started using half as much green stuff. It makes it less "tall" and I can cut to the base and still have it look good. And yeah, the angled one is pretty sweet, but I gotta have some variety! 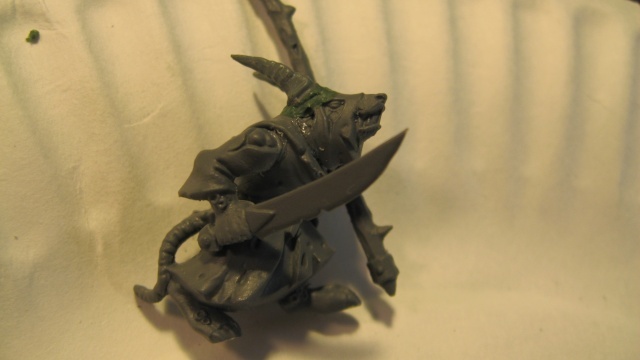 Only the coolest Skaven kids on the block get angled bases. are angled floors like monocles? More like solid gold cockrings. The ideas I've got in my head, baseswise, are stone bases for my skaven, wooden bases for my witch hunters, and autumnly, earthy bases for my wood elves and graveyard earth style bases for the undead I hope someday to get. I bought some green stuff waiting for it to ship. I like what you did with the wolf models, metal heads are way cooler. 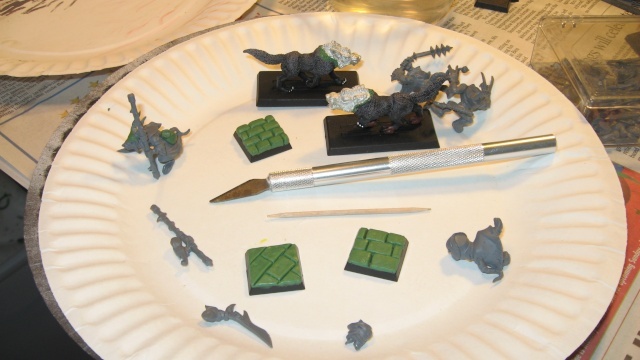 The bases will turn out great, I'm unsure how I'll apply the green stuff to my based models probably wont even do it. Do you mean applying it to the bases of models already on bases or just applying it to the models themselves? I pretty much planned to just cut them off the bases, although slotta bases will be trickier. Well, yeah. I don't think I have the courage to re-base the models. Well, fortify yourself with liquid courage and cut their god damned feet off.